UNAIR NEWS – Philanthropist and CEO of Mayapada Group Dato ‘Sri Tahir gave research grants to 10 professors of Universitas Airlangga. The research grants worth 10 billion were given to advance education and research in Indonesia. 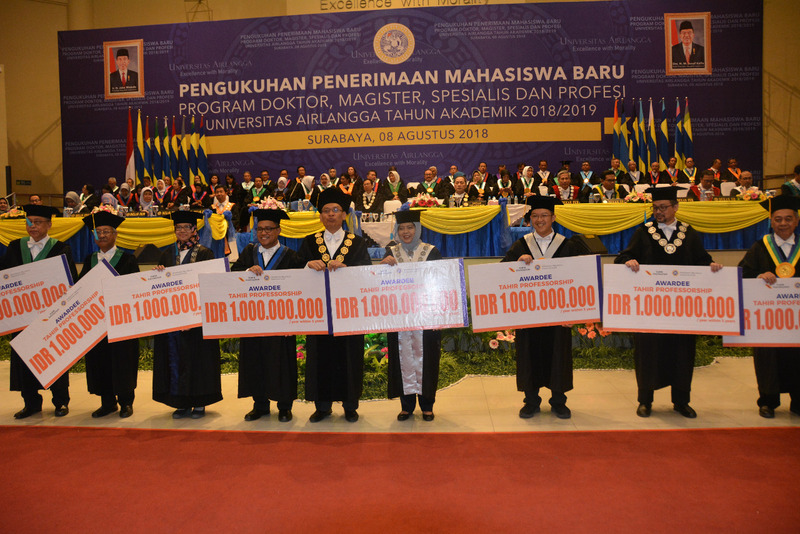 The awarding ceremony was carried out in the inauguration of Masters, Doctoral, Specialist and Professional degree freshmen at Airlangga Convention Center (ACC) Campus C UNAIRon Wednesday, August 8. Regarding the research grant, UNAIR Rector Prof. Moh. Nasih said that the 10 professors were top scientists whose works have given a lot of influence and impacts. “They (the researchers, ed) are the faces of this universities abroad, because their works are cited by other academics abroad. On the other hand, UNAIR does not want there is imbalance on Tri Dharma of Higher Education, “explained Prof. Nasih. The rector said that UNAIR is still lacking in research so far. Therefore, professors who are very productive are encouraged to improve their productivity through various ways, including professorship grants from Tahir Foundation. “The grant worth a billion a year, for 3 years. There will be an evaluation in one year to see the progress, “said Prof. Nasih who is also among 10 professors awarded the research grants. Prof. Nasih also stated that the grants could be transferred to other professors who have better performances and greater targets. 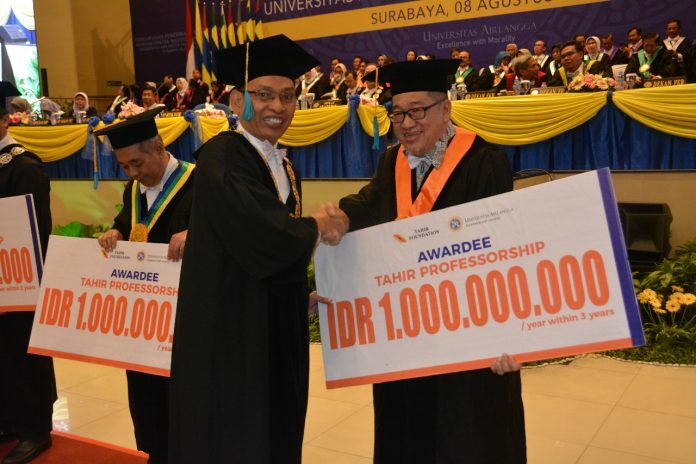 Tahir Professorship Grant was given to 10 UNAIR professors. They are Prof. Soetjipto, dr., MS, Ph.D. (Professor of Faculty of Medicine, researching in Tropical Infectious disease), Prof. Dr. Kuntaman, dr., M.S., SpMK. (Professor of Faculty of Medicine, researching in antimicrobial resistance and infectious disease), Prof. Dr. Ni Nyoman Tri Puspaningsih, M.Si. (Professor of Faculty of Science and Technology, researching in structure and function of industrial lignocellulosic complex enzymes), Prof. Dr. Moh. Yasin, Drs., M.Si. (Professor of Faculty of Science and Technology, researching fiber sensors and fiber lasers). Also, Prof. Dr. Mohammad Nasih, SE, MT, Ak., CMA. (Professor of Faculty of Economics and Business, researching good government governance), Prof. Dr. Dian Agustia, S.E., M.Si., Ak. (Professor of Faculty of Economics and Business, researching environmental sustainability and corporate governance), Prof. Badri Munir Sukoco, SE, MBA., Ph.D. (Professor of Faculty of Economics and Business, researching the dynamics of competition and organizational performance), Prof. Ir. Moch. Amin Alamsjah, M.Si., Ph.D. (Professor of Faculty of Fisheries and Marine, researching seaweed exploration and development culture technology), Prof. Dr. Suharjono, Apt., M.S . (Professor of Faculty of Pharmacy, researching translational medicine), and Prof. Dr. Bagong Suyanto, Drs., M.Si. (Professor of Faculty of Social and Political Sciences, researching radicalism and religious intolerance). There are three outputs expected from each professor in three years. First, they are obliged to produce three papers publications in top tier journals (top 300 or top 10 of each category subjects). Second, they are obliged to produce three papers publications in top tier journals (top 300 or top 10 of each category subjects) with under review status. Third, they will produce two books published by national publisher and one book by prominent international publisher.